For the longest time I thought fountain pens weren’t for me. I was a gel pen girl through and through. For day to day use, that’s still true. However thanks to doing it a little fountain pen research when planning a present for Ed I realised I quite liked them! When Ed’s TWSBI arrived and I had a play with it I started thinking maybe I should buy one for myself. Digging through my pen collection I found my old Parker fountain pen. This thing must be a bit of an antique now, I’m sure I’ve had it over 15 years! Ed managed to dig out a cartridge he had for it (seriously, we’re both stationery hoarders) and I started using it in my Leuchtturm. The plan was to use this in my bullet journal for a few weeks and if I enjoyed writing with it, treat myself to a nice new one. As I’d just received a beautiful new Hobonichi Weeks (pictured above) I couldn’t resist the thought of a nice fountain pen for that lovely Tomoe Paper. Unsurprisingly I loved writing with this and was happy to see that my handwriting was pretty neat with it. I’d also ordered myself a Hobonichi Cousin so I knew I had to do some fountain pen shopping! When I was doing my pen research the Platinum Preppy kept getting mentioned as a fantastic little budget pen. As my Hobonichi Weeks is going to be my new every day I figured a nice cheap pen to go in the bag too would be ideal. The pen was just £2.75 and the the cartridges just £1.75. Absolute bargain! For the pen to go with my Hobinichi Cousin I decided to stick with a brand I knew from purchasing Ed’s pen – TWSBI. Instead of splurging on the same one I bought Ed, which I think was the Diamond, I went for the Eco. At £27.99 I thought it was a good price for my first ‘proper’ fountain pen. Instead of black ink, I went for grey Diamine ink. I bought Ed the black version of this and had been impressed with the quality of the ink. This cute Japanese green pen came with a green cartridge and is available in a good range of colours and nib sizes. The nib size I went for was fine. The Parker is a medium nib and while I write nicely with that, my handwriting can get a little large if I’m not careful. As the Weeks has a small grid, I figured a fine nib would help keep my writing size in check. I have had absolutely no issues with this since I started using it. It’s sturdy, well made and writes beautifully. On looking back through my pages the ink flow isn’t consistent. Some letters look darker than others. It can be quite noticeable and while it doesn’t bother me, because it’s such a light colour green it may bother others. Looking at how much ink I’ve already used I think I’ll go through the cartridges quite quickly, but for £1.75 for two I’m not too worried. After buying Ed a clear fountain pen I knew I had to stick with that style. I love how clear fountain pens look. Given it was my first time refilling a fountain pen I found it surprisingly easy to do. Just a bit of a wipe of the excess on the nib and in the lid and it was good to go. This, like the Preppy is a fine nib. This actually writes a little finer than the Preppy and took a little getting used to. My writing isn’t too neat with it just yet, but with a little practice I think I’ll get there. It’s a really comfortable pen to write with and as expected feels really well made. The only thing I’ve had to be careful of is when putting the pen into a pen loop. I have to try to not accidentally turn the end of the pen as that starts squeezing the ink down. This pen has some similar ink flow issues as with the Preppy. However, this only really occurs when I leave the pen lid off and the ink collects on the end (I think). Again, this is probably more noticeable because it’s a lighter colour. At first I really regretted not buying the medium nib for this, but it’s slowly growing on me. I know if I’d have bought the medium my writing would be huge. Just because you can’t have a pen post with a comparison picture, here’s the three pens in the pen test section of my Leuchtturm. As you can see, my writing is so much bigger with the Parker. When I look at that, I’m glad I chose fine nibs. So what are your thoughts on fountain pens? 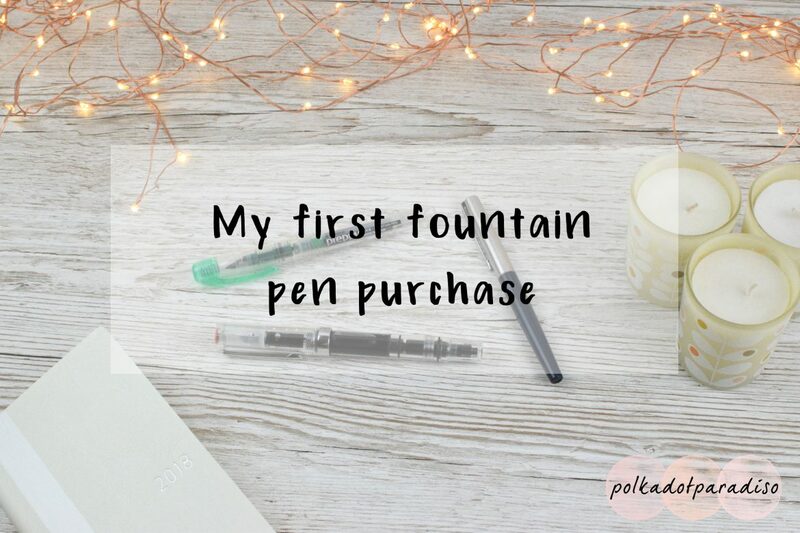 I’d never use them day to day or in my regular planners – the feathering when I used a fountain in my Happy Planner was insane! However, for my bullet journal or Hobonichi these are perfect. Now all I need to do is not fall down the rabbit hole of fountain pens and start collecting!